Who’s ready for some post holiday blues recipe? Get this ready for your dinner treat. Go on, you know you want to! This is a super easy recipe which I’ve always been too scared to attempt and would rather leave it up to the professionals in super Chinese kitchens. Turns out, it’s really simple and easy to serve up. The fear was just all in my head. 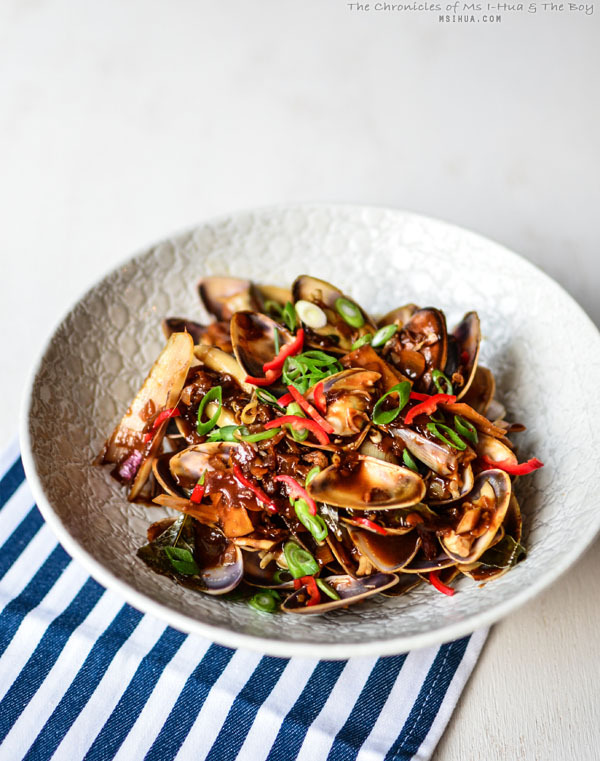 Pipies (in Australia) and Lala (in Malaysia and Singapore) otherwise known as clams to the rest of the world are delicious little molluscs of joy and they are super easy to cook. We bought a kilo of these beautifies from the market last week and I cooked them in my favourite Malaysian style, Kam Heong style (Golden Fragrance if translated directly from Cantonese). Heat about 3-4 tablespoons of vegetable oil in a hot frying pan (or a wok) and saute the dried shrimps until fragrant. Add in the shallots, spring onion, dried chillies, curry leaves, lemongrass, ginger and red chilli and continue to fry, taking care to toss the ingredients around until fragrant. Add in the clams and seasoning mixture and stir-fry on high heat. Cover with a lid for about 2 minutes or until the clam shells have all opened up. Add in 1-2 teaspoons of the slurry mixture to thicken up the sauce whilst mixing all ingredients thoroughly. Dish up and garnish with a sprinkling of spring onions and red chilli and serve immediately with hot steamed rice. What do you think? The beauty of this recipe is that it caters for most shellfish and seafood. 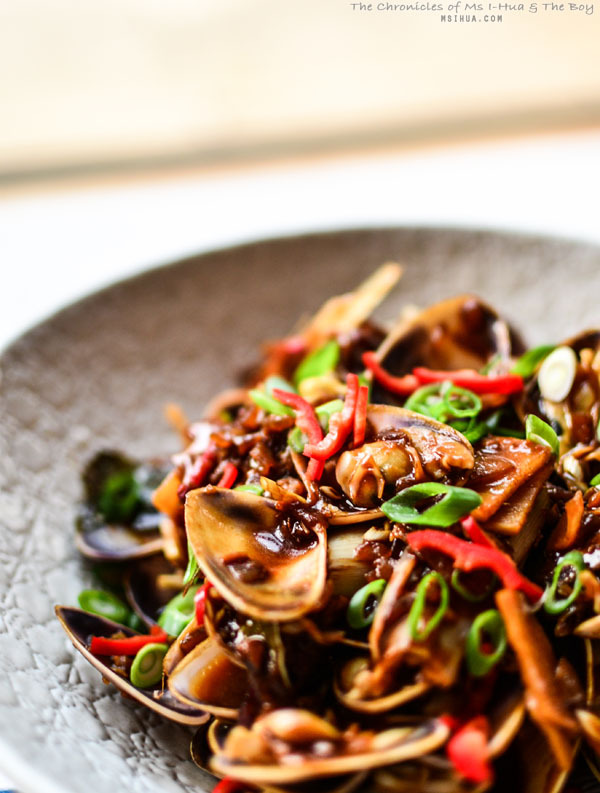 Kam Heong is the preferred style of cooking seafood which most people order when dining out at a local seafood restaurant. Be it crabs, clams or prawns, this is a finger lickin’ recipe! Mmmm – looks so tasty – finger licking good! 🙂 Love your choice of ingredients, in particular the lemon grass and ginger. Thanks. It’s a favourite at home! We bought these from Vic Market..
yum! i love clams/pipies!dishes with pipis must be saucy and rich! He played no part in this! I used to dig for pipies on Fraser Island … they were used for fish bait though, I would never have thought to cook them up and eat them myself! Did you just indirectly call me a clam? You made this dish look easy to prepare with the short and sweet recipe. Thanks a bunch! ” best left to the professionals” you are a pro! Looks great.